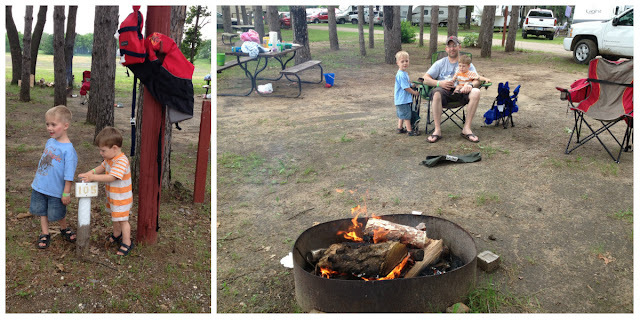 Camping has always been one of those things that my husband and I did together each summer. We started off with a teeny tiny tent and later upgraded to a roomier one. We camped several times a summer--at campgrounds, on a sandbar off the Mississippi River, at the in-law's lodge--wherever and whenever the desire struck. This past-time was slightly compromised once our carefree lifestyle morphed into parenthood, but it was something we wanted to share with our children, too. 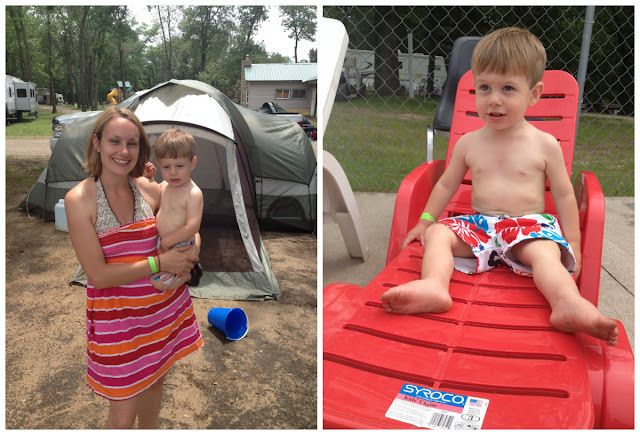 So each summer we set out with the romantic notion of camping like one big happy family, which undoubtedly is always squashed within five minutes of arriving at the campground. The initial set-up alone is enough to send us packing back home: kids wanting to help who only get in the way, bugs--oh my goodness, the bugs! !--the troublesome rainfly that we can never remember which direction it goes on the tent, the numerous items to situate and resituate, runaway kids, and did I mention the pesky bugs? This is where we would have slept if things had gone as planned. 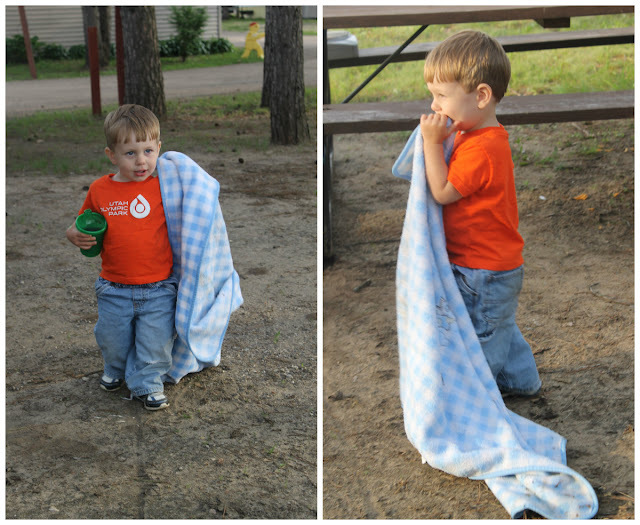 Ashton insisted on dragging his blankie around with him. I'm so glad I thought to bring an extra one for just this specific purpose. Once camp was finally set-up, we tackled supper. Spencer loved being big enough to roast his own hotdog, until the "steam" blew into his eyes and he quickly handed the stick to me. Because of the incessant rain, the usually small, inviting river was high with a fast current, washing away the hideaway beach tucked away in a corner off the main beach, where we spent a long afternoon last summer. The first night of our trip we meandered down to the river just to gauge the rain's handiwork to see whether it'd be a manageable trip the next afternoon. Big mistake. The bugs swarmed and viciously attacked us. We stayed only long enough for Spencer to throw a few rocks into the water and then we scurried as fast as we could for escape. Not fast enough, apparently. Mine and Spencer's skin quickly swelled and itched from the bites. 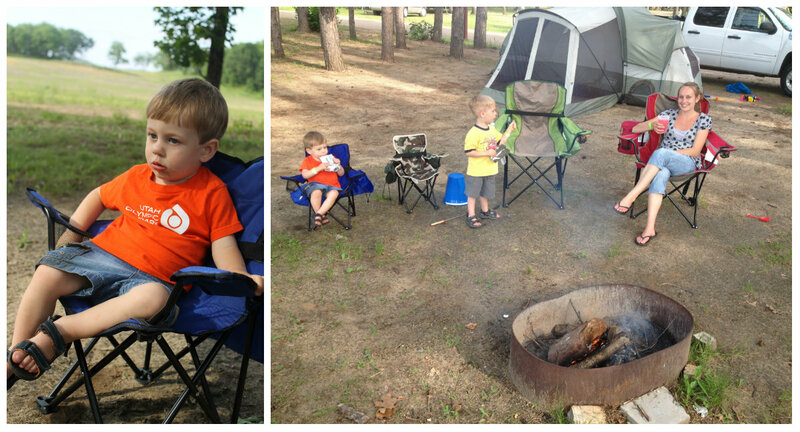 The best part of camping, in my opinion, is the camp fire. There's something mesmerizing about sitting around the blazing heat, watching the embers burn. We only got to enjoy this briefly, making our first s'mores of the season, before the storm chased us off to safety. We fled to the in-law's, who have a secluded lodge atop a big hill on the property. Our reasoning for stopping there for the night instead of just continuing the short distance back home was because it'd still feel like camping. Another big mistake. 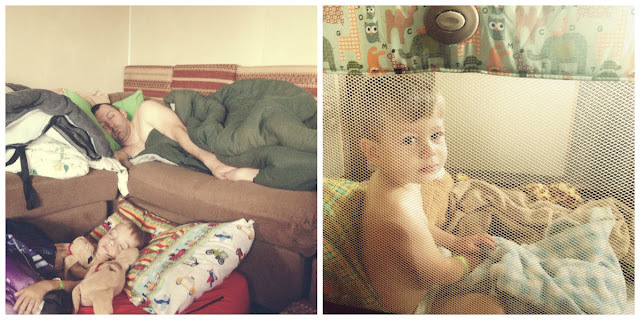 We didn't account for the late night and overtired boys who really just needed their own beds. It was a long night, leaving us all a bit sleep deprived. But things looked better in the morning light. We made breakfast, and our coffee was hand-delivered on a Kubota-driving old man always ready to accommodate the ever-present guests at his home. And I'm not going to lie, showering in a house instead of at a campground sure was nice. Before returning to the campsite, we drove around so the tired boys could nap, not even daring to attempt naps in the tent. 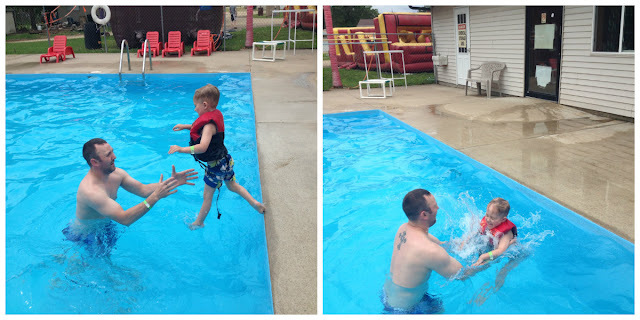 After lunch, we hit up the pool, where Spencer showed off his new independent swimming skills. 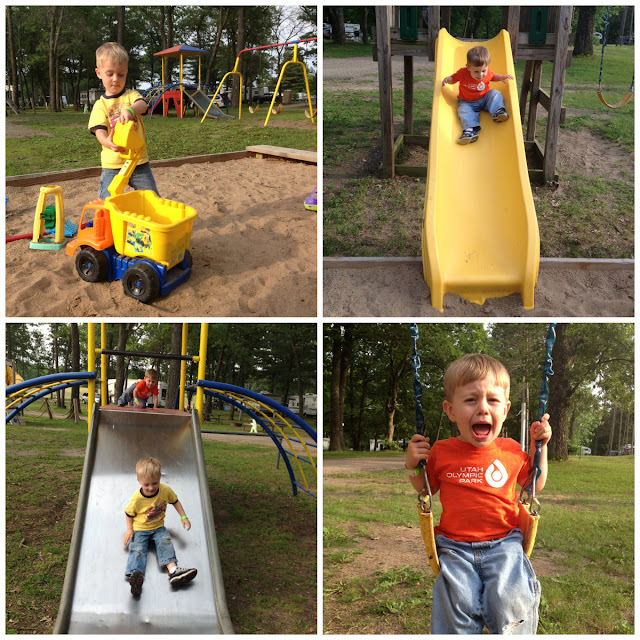 Later was a hayride and ice cream social. Then back to the campsite for the night. After supper we heard the loud horn of a trolley that just happened to make a pit stop at the campground's bar. 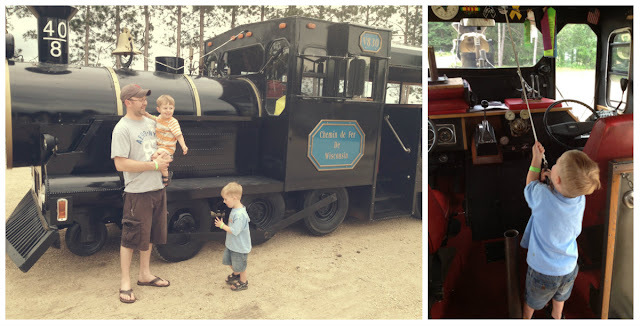 My choo-choo-loving boys' eyes grew large, and we had to investigate. The trolley driver was nice enough to oblige their curiosity and allowed us on board, where they got to ring the bell and sound the horn. I'm pretty sure this was the highlight of their trip. 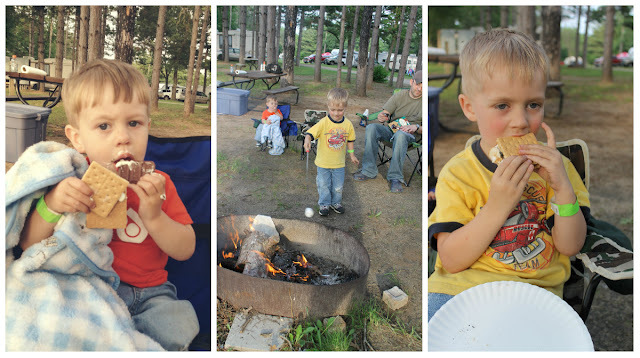 One last campfire; one last s'more. Dismayed upon discovering his precious blankie was dirty. We decided to pack up and head home for the night instead of braving another sleepless night away from home. Our attempted camping trip of 2013 may not have been the romantic picture we visualized in our heads while we sat around the campfire in our carefree, kid-less lifetime, but we sure do know how to make memories nonetheless.